Gympie’s Valley Rattler is calling to its supporters, friends and patrons to assist in keeping the iconic tourist attraction up and running heritage steam train tours through the beautiful Mary Valley. The heritage steam train operator has kept its four days a week services operating through the last two years of adverse conditions – flood and an extended tourism downturn – thanks to the dedication and commitment of staff and volunteers. (There was also a brief suspension of services in July which turned the usually profitable July and August into loss months). Donate to our Support the Rattler fund. Contributions will directly aid our restoration and maintenance activities. To commence this operation in 1997 the Gympie community contributed significant funds to enable the Valley Rattler’s start up. We ask Sunshine Coast and Brisbane supporters to join with Gympie locals to keep the operation going – contact the Gympie office on 5482 2750 for details and ask about tax exemption status. Encourage your friends, guests, and next door neighbours to Ride the Rattler, and to do it now. Over half of our customers say they come to us because word of mouth – from friends, relatives, tour desk operators, the person at the servo and at the shops! – so please spread the word! Drop in to the Old Gympie Railway station in Tozer St in Gympie, take in the atmosphere of the 99 year old Gympie station building, enjoy time in the Refreshment Rooms café, buy a souvenir and chat with the staff – open seven days. Tony Hallam said, “The volunteers of the MVHR receive much thanks from patrons for their great service. They need your help to keep the Valley Rattler rattling”. The Valley Rattler heritage steam train tours through Mary Valley are operated by the Mary Valley Heritage Railway every Saturday, Sunday and Wednesday. 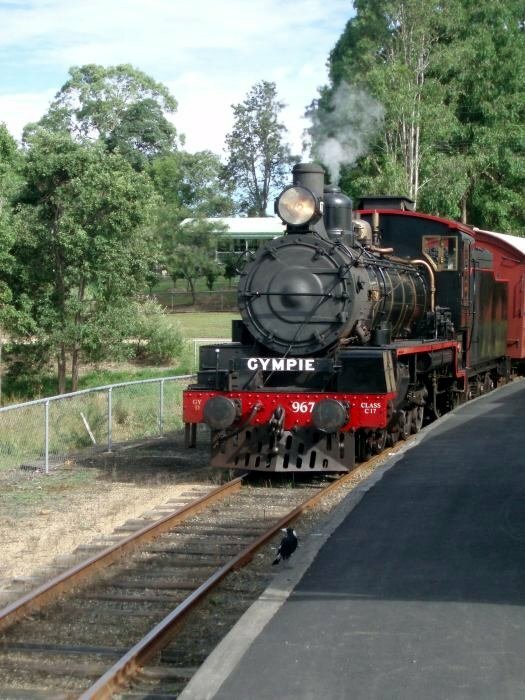 Tours depart from the historic Gympie Railway station to Imbil or Amamoor. The Red Rocket Heritage Railmotor operates every Tuesday morning. The Valley Rattler is located at the Old Railway Station, Tozer St, Gympie. Gympie is a two hour drive north of Brisbane and 60 minutes north of Noosa.